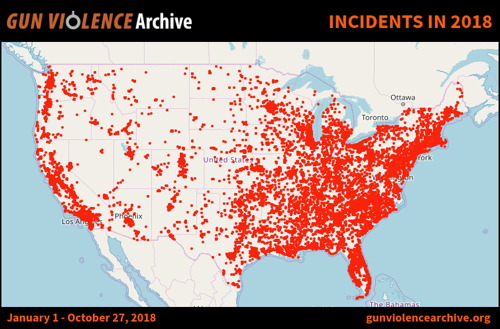 There have been 47,238 gun incidents across the United States in 2018 -- and thanks to Gun Violence Archive (GVA), a not for profit advocacy group offering information about gun-related incidents in the United States, they all presented in charts below. As we reported last week, eleven people were killed, and at least six more were injured -- including four law enforcement officers -- when a gunman opened fire at a Pittsburgh synagogue Saturday morning. "It's a very horrific crime scene," Alleghany Public Safety Director Wendell Hissrich told reporters during a press conference Saturday afternoon. "It's one of the worst that I've seen." As the nation comes to grips with yet another mass shooting carried out by an angry man with a gun, the Anti-Defamation League, which tracks anti-Semitism in the U.S., said the attack was "likely the deadliest attack on the Jewish community in the history of the United States." "It is simply unconscionable for Jews to be targeted during worship on a Sabbath morning, and unthinkable that it would happen in the United States of America in this day and age," the group wrote. 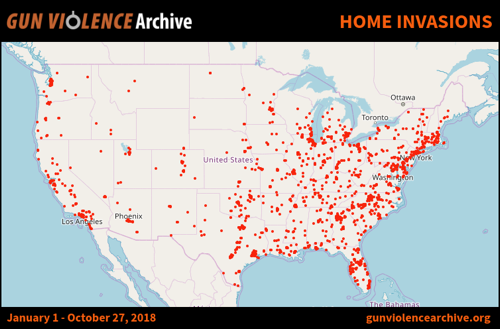 In 2018, including this weekend's mass shooting at a synagogue in Pittsburgh, there have been 47,238 gun-related incidents resulting in 11,991 deaths. 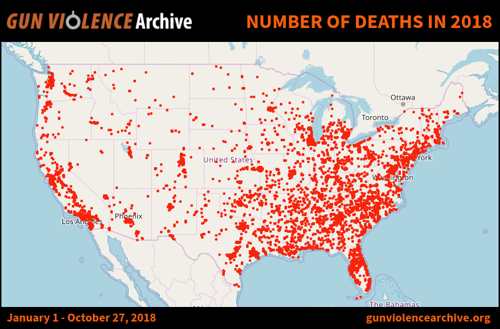 GVA shows gun death concentrations are the highest in Northeast and Southeast regions. Over 23,359 injuries from gun-related incidents were recorded so far this year. 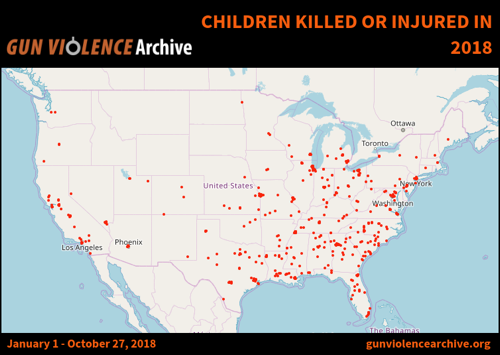 Of the total gun deaths, 548 were children, while 2,321 were teenagers. 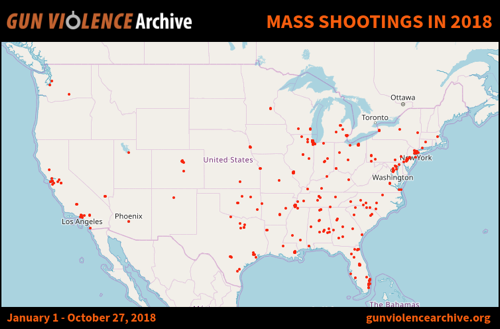 Mass shootings incidents in 2018 are heavily concentrated in the Southeast and Mid-Atlantic area. Home invasions involving guns are mostly concentrated in Northeast and Southeast regions. 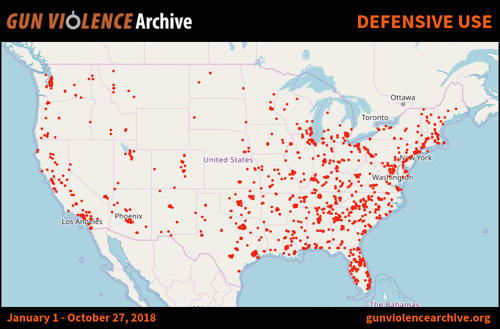 GVA shows gun-related defensive use incidents mainly occurred in the Southeast and Northeast area. "There are, of course, arguments from staunch gun-rights supporters that an armed citizenry is a safer citizenry. Nothing stops a bad guy with a gun like a good guy with a gun, is a popular National Rifle Association talking point. And President Trump pondered aloud on Saturday whether guns inside the synagogue might have led to a less tragic outcome, said MarketWatch. 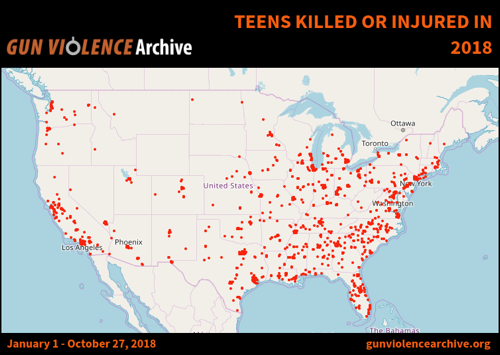 While the data above certainly supports America could have a gun problem, we do not find it odd that most of the shootings have occurred in the Northeast and Southeast regions. Many of these areas have been de-industrialized over the years, which has resulted in widespread social and economic woes for its residents. It seems that the social costs of de-industrialization are finally being realized in gun-related violence.